What’s Amiss with the Legal System? Against the somber backdrop of the Cambodian Killing Fields, the Young Liberals and Democrats (YLDA) held a workshop on peace and human rights. 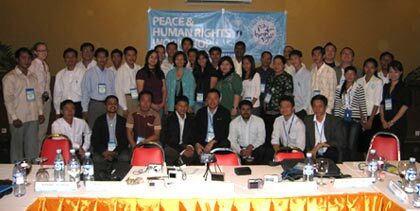 Co-sponsored by the Friedrich Naumann Foundation for Liberty (FNF) and hosted by the Sam Rainsy Youth Movement, it was held in Siem Reap from 29 October – 2 November 2008. A visit to the memorial of the Cambodian massacres perpetrated by the communist Pol Pot regime provided a reminder of the evil forces that continue to threaten the fabric of society. Michael Guzman, consultant of Philippine Human Rights Information Center, set the tone of the seminar by stressing that all conflicts can be avoided if governments and their citizens respect human rights. He said that awareness and education come before appreciation; hence, the key is to educate the public. With these goals in mind, the young liberals from seven countries learned: documentation, fact finding and advocacy work. The skills imparted included report, case and press release writing, networking and campaigning. The workshop ended with participants presenting viable advocacy plans aimed at raising awareness of various human rights issues. “The country that saw 2 million of its citizens killed in the worst human rights violation in Asia’s recent history shall now see the rise of new and young leaders who will become the vanguards of peace and human rights in Asia,” said YLDA President Jan-Argy Tolentino.